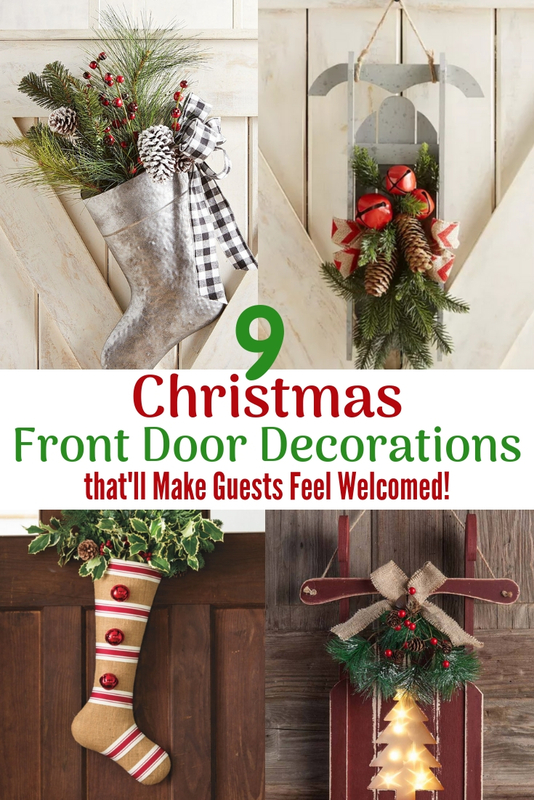 9 Christmas Front Door Decorations That’ll Make Guests Feel Welcome! 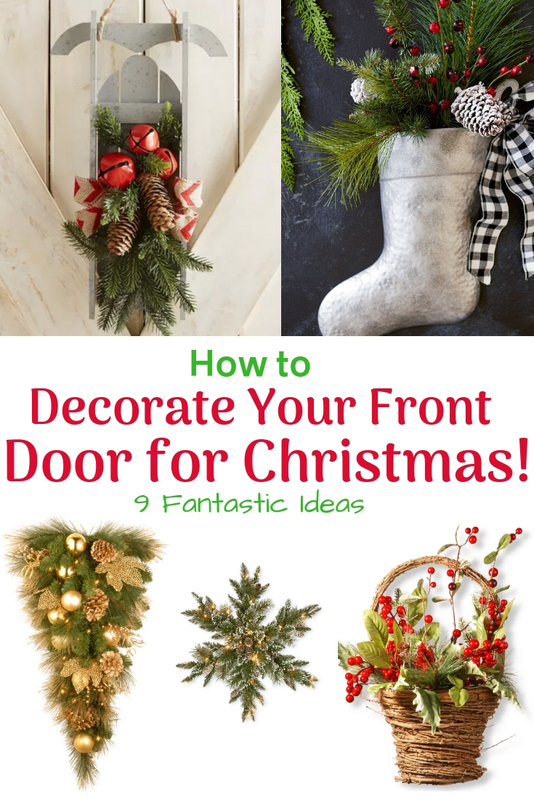 Searching for Christmas Front Door Decorations That Aren’t the Traditional Round Wreath? Looking for something different for your Christmas Front Door Decorations this year? If you are searching for alternatives to the traditional round wreath, maybe we can help. We have a few ideas that are perfect for decorating your front door. And provides a grand festive look to your home decor. Everyone of us loves to create our own unique Christmas decorations. Christmas decorations that reflect who we are, our home, and our tastes. Sometimes there just isn’t enough time in the day to get it all done. Our workdays are filled with long days at work and shuttling kids back and forth. Which leaves little time left for those DIY projects, we look forward to. If you are in need of some show stopping Christmas front door decorations, take a look at these ideas. Beautifully designed Christmas front door decorations to dazzle your family and house guests. Front door decorations are the first impression that your house guests see as they arrive for Christmas gatherings. These decorations set the mood for your holiday gatherings. Take a look at these jewels. Be sure to tell us what you think in the comments below. 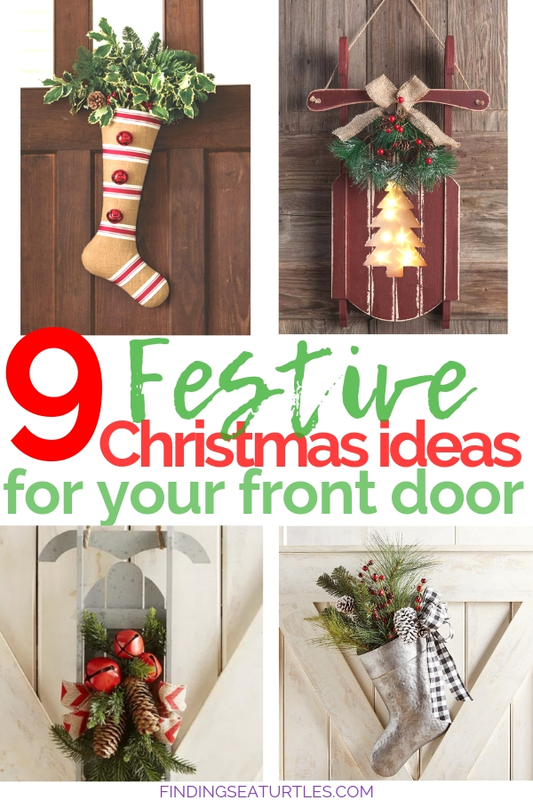 Enjoy these 9 Christmas front door decorations! Need a little Christmas right this very moment? 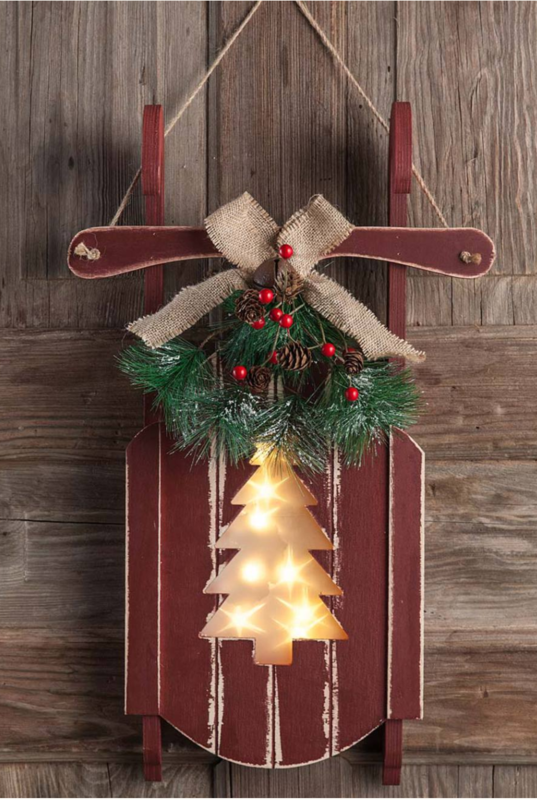 How about a Hanging Wooden Sled with Holiday Cutout Design for your front door? This illuminated Wooden Sled has a tree cutout design. Added greens with berries and pinecones adorn this sled. A nostalgic look for your covered porch or hung indoors. LED lights are battery operated with timer included. The Sled also features a beautiful burlap bow and a rustic jingle bell. Measures 24 inches length, 9 inches in width, and 4 ½ deep. Crafted of mixed greenery with glitter filled tips, the Glittery Bristle Pine Snowflake is dazzling. With white tipped pine cones, the Snowflake has LED lights with timer. The 14 inches in diameter with 4 inch deep Snowflake is gorgeous indoors or under a covered outdoor porch. A great Christmas front door decorations look for welcoming your holiday guests! The Pre-Lit Elegance Teardrop has 50 clear lights. Trimmed with gold ornaments, cones, and accent leaves, the teardrop adds shimmer to your front door. Perfect for your covered porch area or indoors, the teardrop is pure elegance! An easy and quick display of elegant Christmas front door decorations. With snow sprinkled branch tips, the 32″ Fir Snowflake Wreath delivers sparkle to any holiday decor. A 32 inch wide and long snowflake with 6 inch deep front door decor, the snowflake has white LED lights. Adorn with red berries, pinecones, and glossy bold and shimmering ornaments. The snowflake can be used on your covered porch or indoors. Trimmed with red berries and pine cones, the Holiday Basket is a nice alternative to a wreath. 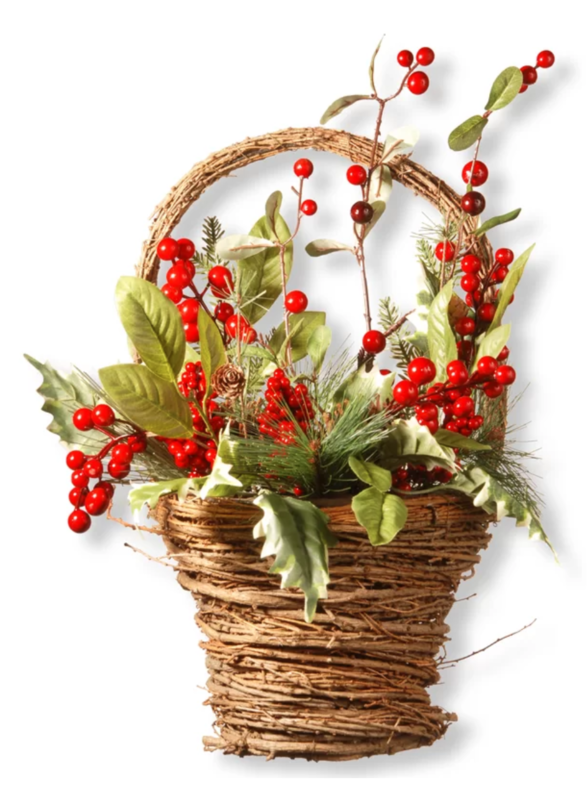 The Holiday Basket is a woven branch basket with green foliage and evergreen tips. A warm welcoming display of Christmas spirit makes this Holiday Basket a hit. Measuring at 22.5 inches tall, 15.75 inches wide, and 11 inches deep. 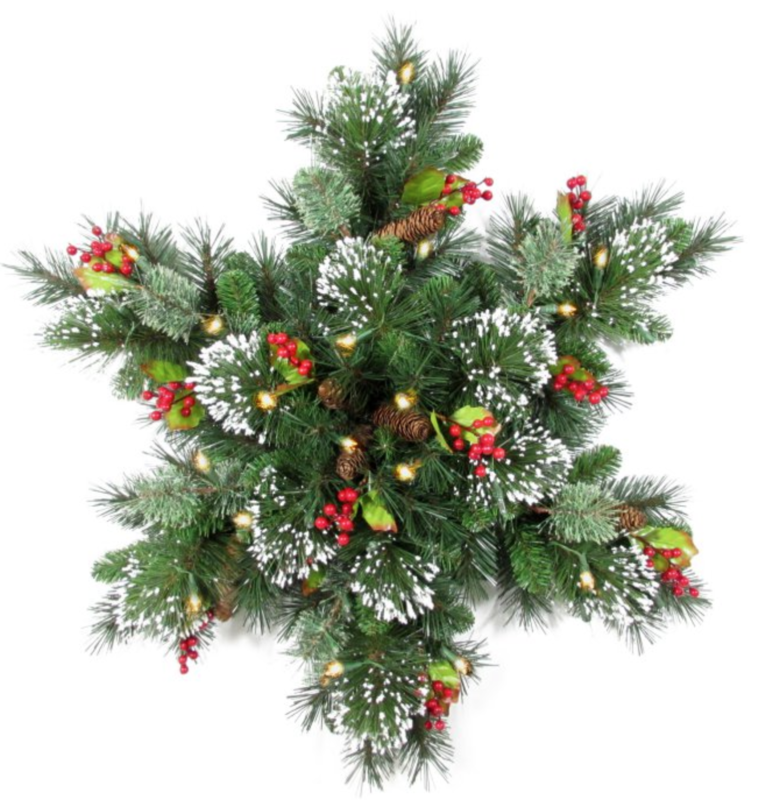 A 32 inch length, width and 5 inch depth, the Wintry Pine Snowflake is a delightful front door addition. 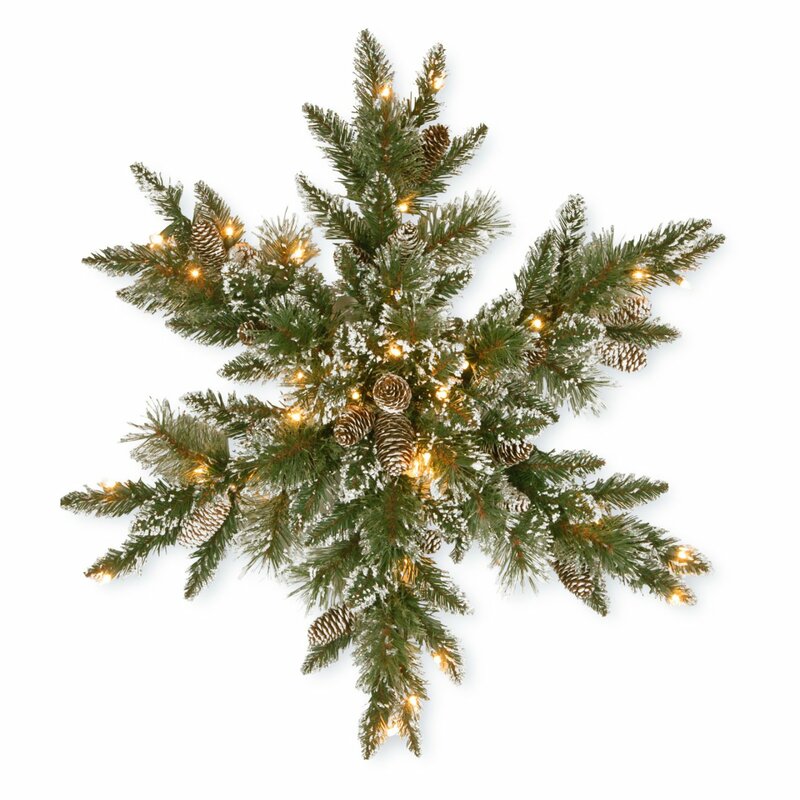 Adorned with red berries and pine cones, the Snowflake has warm, white LED lights. Battery operated with timer is included. 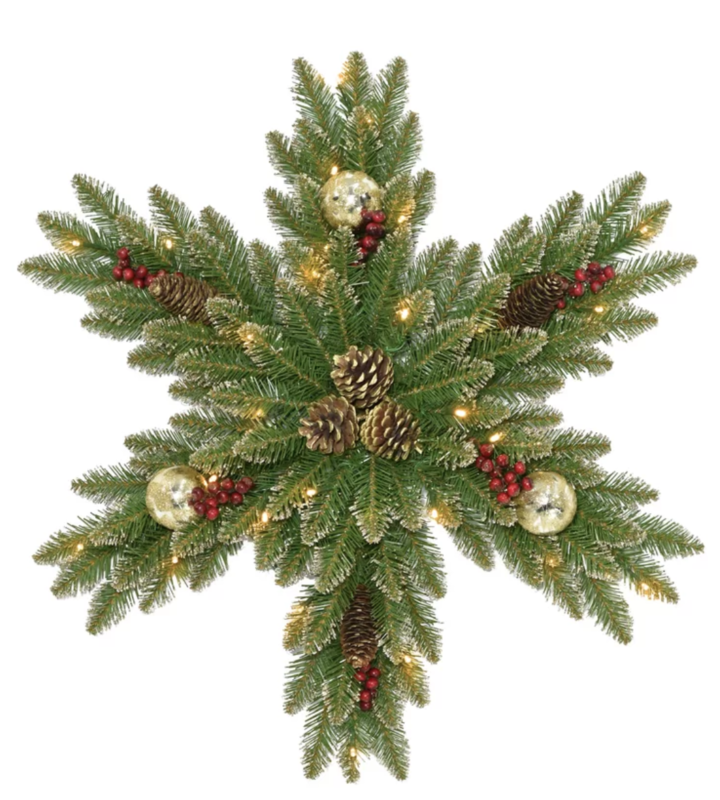 The Snowflake provides an instant festive look to any covered front porch or indoor room. A whimsical stocking with evergreens! 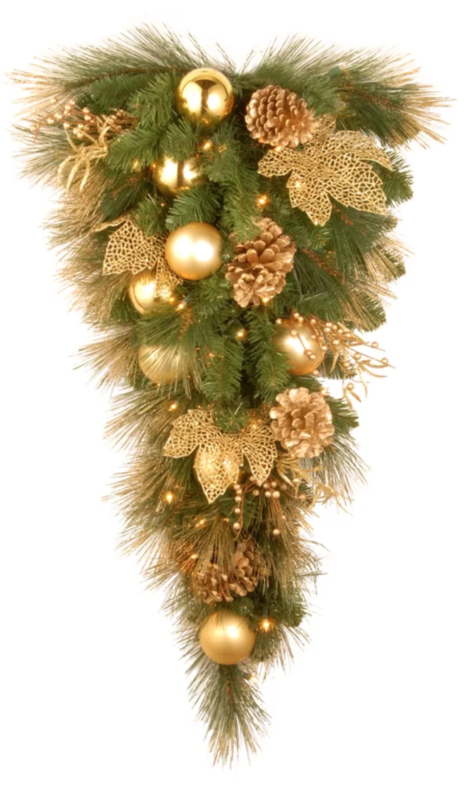 Ideal for indoors or under a covered porch, the Nostalgic Noble Fir Stocking is adorable. At 22 inches long, Nostalgic Stocking has red and white striped ribbon with large, red jingle bells. Create pure holiday magic with this Nostalgic Stocking for all your holiday guests to admire. This stocking will quickly become a guest favorite of those from 1 to 92! Charming Sled with Greenery adds a joyous Christmas look that reminds one of past childhood days. Adorn with bright, red jingle bells, greenery, and pine cones. The striped burlap ribbon adds some ever popular farmhouse look to this Sled decor. Ideal for use under a covered porch or indoors, the Sled is a classic Christmas look. Measures at 18 inches long, 10 inches wide, and 4 inches deep. 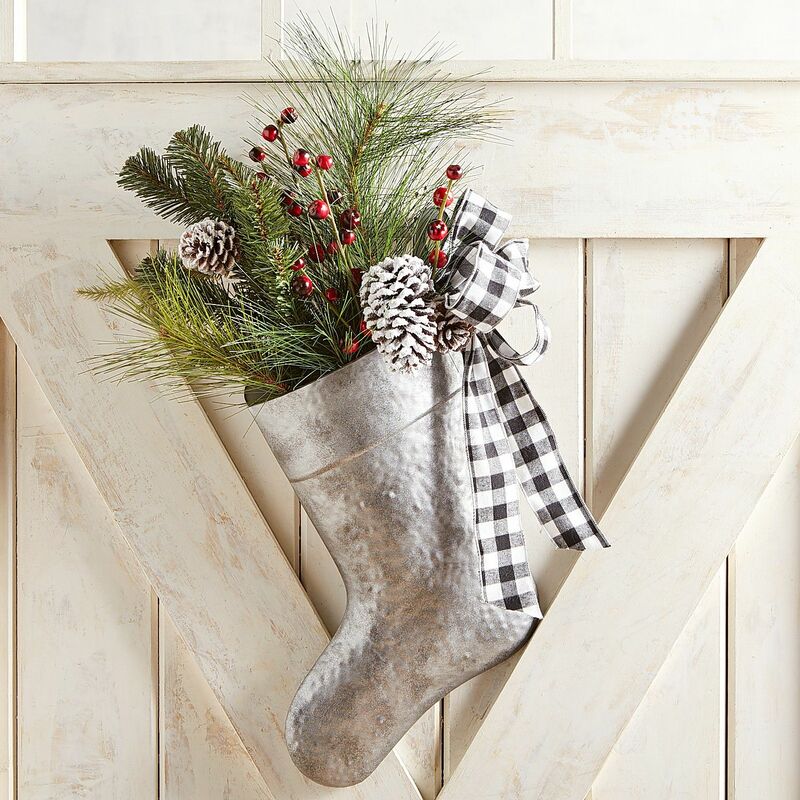 Measuring at 25 inches long and 12 inches wide, the Galvanized Stocking & Faux Greenery is gorgeous. 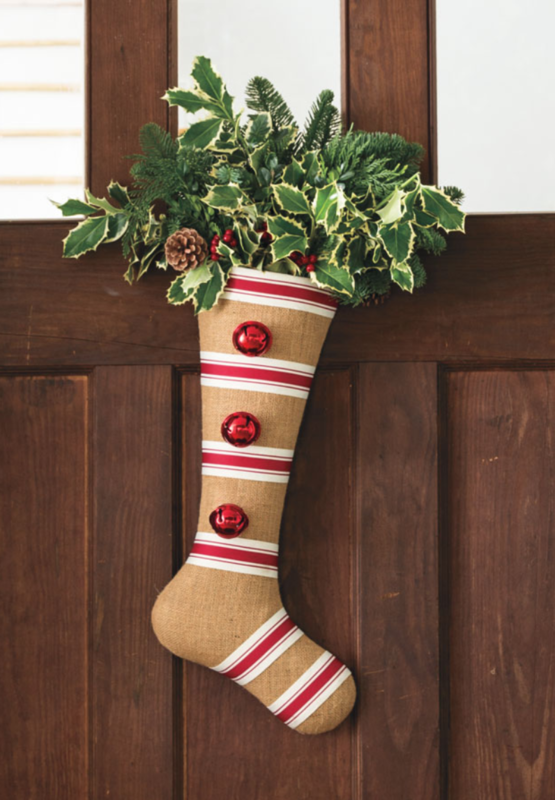 With its hammered galvanized stocking, the Stocking is filled with greenery, red berries, and pine cones. Adorned with a black and white plaid ribbon, the lovely Stocking adds warmth to any home. Stunning Christmas front door decorations for any covered porch or for indoor use. If you are searching for Christmas front door decorations, any of these pieces will look fantastic in any home. These are 9 Christmas front door decorations to welcome holiday guests. Perfect decor when you are short on time. Spend time with family and friends. And save time with one of these ready to use front door decorations. Consider these pieces, when you need a little Christmas right this very moment on your porch! 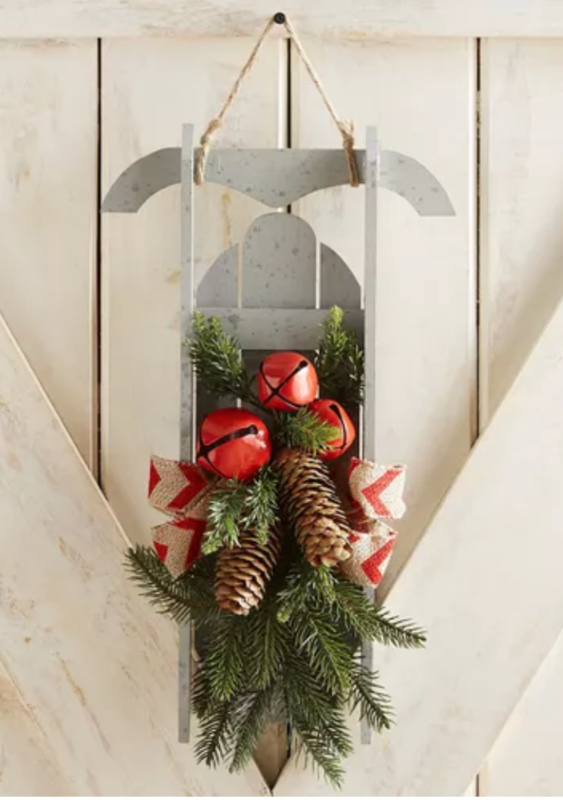 Create a holiday favorite with one of these Christmas front door decorations. These decor pieces are versatile and can create the right mood for your family gatherings. Add instant holiday decor to your home throughout the Holidays. A great gift for home decor lovers. A real show stealer! If you have some favorite Christmas front door decorations let us know. Consider sharing your holiday look with us. And if you try any of these Christmas decor ideas, let us know how you make out! As always, thanks for visiting!